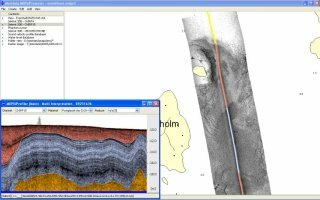 MDPS is a powerful package for integrated processing and interpretation of marine geophysical data. It allows bathymetric, sub-bottom profiling, reflection seismic, side-scan sonar and magnetometer data to be concurrently processed, visualised and exported to surface modelling, CAD and GIS systems. Being geographical by nature, marine geophysical survey data is most rationally accessed via a map interface. The MDPS Projector interface provides the tools for management as well as versatile and fast visualisation of survey data. It also functions as the gateway to raw sonar data. All survey data and survey-related data is visualised as map layers. Raw data is directly accessible via point and click on the map. Right: MDPS Projector map interface portraying ENC data, side-scan sonar mosaic and survey runlines. Logged survey data consists of raw unfiltered observations. This enables the use of different filters and full use of sophisticated spatial computations in post-mission processing. Where the advantages of this approach truly materialize is the processing of sonar data. The versatile MDPS Profiler tool fluently cleans large sets of bathymetry data, while providing an expedient interpretation interface for seismic and sub-bottom profiling data. MDPS can automatically processes vast numbers of depth points to allow efficient bathymetric data cleaning. Moreover, MDPS has versatile visualisation and editing tools that allow fast access to and inspection of soundings in finest detail. Right: MDPS Point Cloud Cleaner display for multibeam echosounder data cleaning. 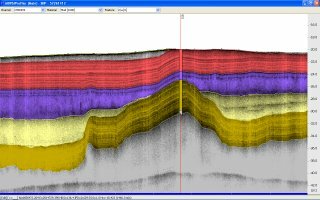 MDPS uniquely integrates marine seismic and sub-bottom profiling data of different frequencies, and allows a single combined interpretation to be made of, e.g., air gun, boomer, and chirp sub-bottom profiles in a single pass. Interpretation is further aided by a number of productivity-boosting features such as survey line crossing interpretation, use of core sample data, and interpretation integrity checking function. Right: MDPS Profiler display for sub-bottom profiler data interpretation. 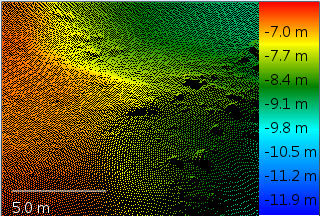 Alongside bathymetric, sub-bottom profiling and seismic reflection data, MDPS offers efficient processing and visualisation of side-scan sonar data. The ability to concurrently process survey data from multiple acoustic sources enables you to quickly obtain a full picture of both the seabed and the sub-seabed. Right: MDPS Projector display showing a side scan sonar mosaic from one survey line, with coloured stripe indicating seabed surfacial material interpreted from the sub-bottom profile seen on the small MDPS Profiler display. 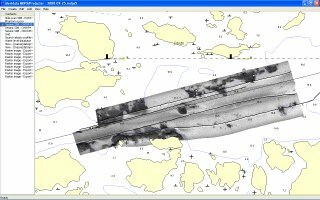 Besides hydroacoustic survey data, MDPS seamlessly incorporates marine magnetometer and other observation data into the geophysical data processing workflow. In the process every observation is given an accurately computed 3D position evaluated against user-specified quality criteria. MDPS is currently available for PCs with Windows 7, Windows 8.1 and Windows 10 operating systems.